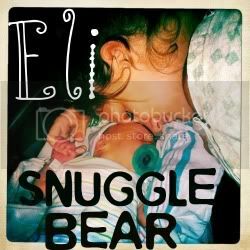 Snuggle Bear Eli: Becoming Infant. As soon as you hit your three month mark, you blossomed into a new baby. You no longer are a blob who just prefers to eat,sleep, and poop. You are becoming very interested in your environment. You turn your head every direction eagerly trying to check things out. I notice your eyes have started to twitch from side to side every now and then. I'm fairly confident it is from lack of optical nerve control that will strengthen over time. I live for those moments when you babble and smile at me. Your babbling has grown from "ooh"s and "aaah"s to some squealing "ooh"s and some angry moans. When I bring you to my face for a kiss you open your mouth wide, turn your head, and screech. Even though i'd like a kiss, I really enjoy what you do. 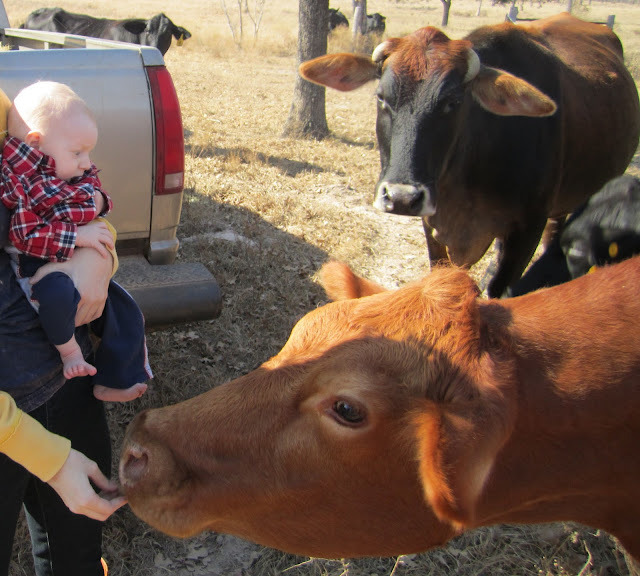 I took you to see your great grandparents the other day, and you saw cows and cats for the first time! You weren't too sure what to think about those furry creatures, but you were very intrigued by the new surroundings. You're growing up my little mustard seed.